A while back, we discussed a space action/4X game on Kickstarter called StarDrive. Several months later, the game reached its funding goals — and much more — making the game a reality. I then contacted the StarDrive’s creator, Daniel DiCicco, and asked for a Q&A to create some buzz for the game, which is described as a mix of Escape Velocity and Master of Orion II. I just got the Q&A back, so I hope you enjoy it. Brian: First off, what was it about Master of Orion and Escape Velocity that inspired you to meld these two different types of games together into something new? Daniel DiCicco: The fact that I put hundreds of hours into both of those games definitely had an impact! It just seemed to me that every 4x since MOO2 was missing the magic. In MOO, I felt a real ownership of my empire and of my fleets. I loved designing that perfect battleship, and then the missile interceptor ships to screen it, and the marine boarding ships, and, well, you know what I mean. In Escape Velocity, it was the adventure that I loved. Jumping into a system, hearing that Red Alert come on, frantically trying to figure out if I can make it to the planet before I’m ganked — I love that. Brian: I read that you were self-taught in regards to programming. Could you share the process you went through in teaching yourself how to create a game like StarDrive? Daniel DiCicco: Well, I did go to school for computer science in undergrad! So I knew how to program before I started making games, but it had been years and years since I had done any real programming when I decided to make StarDrive. That said, I had no idea how to make a game. Knowing the basics of a programming language doesn’t even come close to knowing how to make a game. So I googled it. And starting from the most basic of tutorials, I learned what I needed to learn. It’s all there out on the internet and all you need is the time and dedication to learn. Brian: It looks like ship design in StarDrive is pretty detailed, which space game nuts like me just love. What can you tell us about how ship design works, and how detailed can you get with your ships? Daniel DiCicco: Ship design takes a module-based approach, where you are placing individual lego-like pieces of ship onto your ship hulls. As you unlock new ship hulls, you have bigger and better ships that can fit bigger and better modules. You can’t just install any module anywhere — there are some simple restrictions. For instance, engines can only be installed in engine slots. Weapons must be installed in a slot that has exposure to the outside of the hull. Some modules must be installed in slots that are inside the hull. So I have “E” slots, “O” slots (for outside), “I” slots for inside, and “IO” for Inside/Outside slots, which are hybrid slots. This system is not super-restrictive but provides some basic rules about what goes where so I can balance the game. Weapons and turrets all have “facings” and “fields of fire”. For instance, a Flak Turret may have a 90 degree field of fire. When you install it, you need to set its facing so you know which 90 degrees it covers. In game, this translates into where you can shoot. You fire your weapons with a right mouse click where you want to shoot. All of your weapons that fit the range/field of fire requirements will fire. You can also set certain weapons to auto-fire modes like Point Defense, which will automatically attack nearby missiles, torpedoes and fighters. Many ship modules have other options to select. Fighter Bays let you select which of your fighter class vessels it carries. Weapons can get modifications to affect their costs, like heavy mounts, increased fields of fire, and so on. Finally, you need to build a power grid on your ship similar to how you would in Sim City. Your ship needs power plants to make energy, and these must be placed in an internal slot. These power plants have a power radius — i.e., every slot with in 4 gets powered by the power plant. So if you have one nice power plant in the middle of your cruiser, that’s fine, but those lasers at the front aren’t going to have any power. So what you’ll need to do is use power conduits. You just drag them from your power plants to where you need power. These take up module slots and they can be disabled in combat, meaning a luck shot might knock out your forward shields and lasers. That said, I think the best ship designs will have redundancy built into them so that losing a conduit won’t spell your doom. Brian: Your site claims that while the AI can use the stock ship designs, it can “also steal some of your ship designs”. This sounds like a fairly sophisticated AI. What can you tell us about the AI, both on your own side and that of your fellow empires? For example, in the mentioned scenario, how would the AI know which ship designs to steal? Daniel DiCicco: Stealing ship designs is the easy part! When managing your empire, you can assign an espionage budget to a certain race. If you (or an AI) gets lucky, they can steal your technology, including ship hulls. 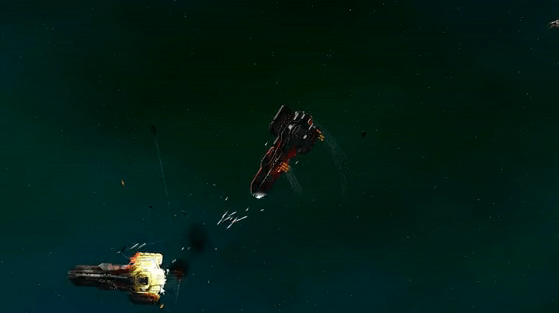 The AI will then be able to build ships using designs that you have saved in addition to the stock ships. The AI will also rate ship designs based on their overall DPS and survivability, so it’s not possible to create a bunch of terrible ship designs to trick the AI into stealing and using. Brian: Planetary colonization also looks pretty detailed, which is awesome. Can you take us through some of the steps needed to successfully colonize a planet? Also, can the AI handle planetary colonization if you’re busy with other things, like combat and what not? Daniel DiCicco: The simplest aspect of colonization is finding the planet. You can send a scout ship out to auto explore or you can visit a system yourself. Double clicking a planet brings up its stats window and you get some lore text along with a rating of its fertility and its mineral richness. Some planets also have specials depending on planet type and so on. To colonize a planet, you just click “Mark for Colonization”. Doing this will queue a colony ship in the best available shipyard. Colony ships are somewhat expensive so it’s important to protect them. They bring a little bit of food and a small contingent of colonists with them to the new planet. You could also just queue a colony ship manually and right click a planet to colonize. When your colony is set up, it’s up to you how to develop it. Initially your colonies are not very self-sustaining. Base resource production is keyed to population, and starting colonies have almost no population. To increase population, you must build freighters and assign them the automated task to ferry colonists. You can also assign freighters to do automated goods transport, which will take food and production from worlds where you have excess to your newer worlds. So if you build a transport at Earth and set Earth to “export” its industrial production, and your new colony to import it, then you’ll see your freighters bringing these goods to your new planet. At the new planet, you can rush your building projects by applying this imported production. The system I am modeling here is realistic and based on how I think space would really be colonized. You send an advance ship to set up the colony, and then you import a ton of pre-fab goods and new colonists as you grow. So the AI will, optionally, have a lot of control over this process. When you colonize a planet you will be able to select a governor who can manage the planet for you. The freighters will manage your goods and colonists for you, and all you really have to worry about is finding the planet to colonize. Brian: Speaking of planets, your Kickstarter page also mentions tactical ground combat, which not a lot of 4X games have (one that comes to mind is a favorite of mine, Imperium Galactica II). What can you tell us about the tactical planetary combat? Will it be similar to space combat (i.e. you’ll have one unit you command like an arcade game), or will it be something different, like an RTS or some such? Daniel DiCicco: So this is the one feature that I basically do not have roughed out in the game just yet. The plan is, time allowing, to do a turn-based ground combat on a small hex map. It may be the case that we will have a simplified ground combat system (ala MOO2) for release and that we’ll do a really fancy ground combat DLC/expansion after release. We’ll see. Brian: If there’s one thing we love in these kinds of games, it’s researching new technologies. Can you tell us how the research in StarDrive occurs, such as what kind of tech trees do we have access to, how resources are poured into it and so on? Daniel DiCicco: In StarDrive your research points are produced at your planets, or through some other means like combat and diplomacy, and they go into a pool. You can then buy technologies by spending your points. This is a break from the more traditional “let’s focus on one tech only” approach that 4x games use, but I think it allows the player and the AI a little more flexibility. I also thinks its a more realistic model because it simulates the reality that scientific advancements can happen in parallel. The way I see it, scientists all over your empire are always working on biology, and weapons tech, and industrial techs, and so on at the same time. So I just allow the player to spend the points that they have saved freely. That said, many high end techs will have some very high costs and you really will need to think carefully and plan which techs to buy and when. Brian: What can you tell us about the game setup in StarDrive? Will there be scripted campaigns, open sandbox scenarios, or a combination of the two, for example, and what details can you give us? Daniel DiCicco: StarDrive is a 4x strategy game through and through, and so I suppose you could call it a sandbox. You can do whatever you want, but you’re not going to win the game unless you’re playing it to win. The AI is going to be out to win through essentially the very same win conditions as MOO2. Win through conquest, diplomacy, or technology. That said, we have a lot of color in the game. There are some adventure-like dialogs that you can have with other races and with unique character ships that you will encounter. For instance, you may encounter a ship that needs help of some sort, and if you provide that help, then you would gain this unique and powerful vessel. Also, there are neutral races that serve as vendors of high-end, unique items like ship hulls and weapons. Brian: Moving onto combat, your site says that in combat, the player will lead forces from their command ship, controlling other ships like an RTS. Could you give us some more detail as to how this works? For example, is it pausable? What kind of control do we have over our ships (i.e. simple commands like “Attack Here” or something more detailed)? Daniel DiCicco: The game is not a pause-and-command game. It’s real-time. However, we’ve been working a lot on combat pacing and I have slowed things down considerably to allow the player to have time to react and to give commands to your ships that really matter. Ultimately, this game will control a lot like the Total War games as far as moving groups of ships around. Making fleets will be simple — you select a group of ships and control group them like any RTS. You can then pick from a list of desired formations including some custom ones. Finally you can tell the fleet to stay information at all times or to move freely. Then it’s just a matter of pointing them at the bad guys. You can micromanage attack orders if you want. There is a lot going on under the hood that I will expose to players in advanced options to really customize how your ships behave. For instance, the ship’s targeting algorithm will be exposed to the player. The player just assigns the weights that the ship will place on a potential target — how important is it for the target to be close to me? How much do I weigh a ship attacking me, or a friend? What about if my friends are attacking the target, how much do I weight that? How much do I weigh if it is injured? What about ship size? Right now there is a default weighting hardcoded into the alpha for all of this, but I will be providing a set of stock behaviors that players can pick and choose from to customize their ships. So, for instance, if I want a fighter I might choose to have it prefer closer targets, targets that are small, and I would want it to fight with its allies. A missile frigate I might choose to prefer targets closer to its maximum range, injured targets, and larger targets. Brian: Finally, a few days ago – as I’m writing this – you announced that you reached your funding goals on Kickstarter, and congratulations on that. How did it feel to come to that part of the journey in creating StarDrive, and what are the next steps? Daniel DiCicco: Oh man, it was really great to reach our funding target and then to exceed it by $10,000. The quality of the art that you will see in StarDrive is unlike anything you will have seen in a 4x to date and this is all because of Kickstarter. What’s next is to keep on coding. I’m aiming to make the best, fully-featured 4x since MOO2. I know that’s a bold ambition, but if you don’t shoot for the stars you’ll definitely never get there. And hey, if I miss, well maybe I’ll hit the moon. Brain here. While StarDrive has indeed reached its funding goals on Kickstarter, the game is also going through alphafunding on Desura, so you can still support the game if you so choose. Thanks for reading!